Well, 2006 is coming to an end. We've learned some lessons, counted our mistakes and tallied our successes, made progress toward clean air, and are ready to enter the New Year fresh, inspired, and ready to go. And as 2007 gets nearer and nearer, it's time to get our New Year's resolutions down in writing. We've done that, and now we'd like to share our resolutions with you. Resolution #1: Empower more families to get involved in efforts to clean air. Resolution #2: Get 500 new members. Resolution #3: Hold at least six member outreach events like parties and slideshows. Resolution #4: Raise at least $75,000 to sustain Rocky Mountain Clean Air Action for 2007. Resolution #5: Get stronger rules to reduce air pollution from oil and gas development in the Rocky Mountain region, including in states outside of Colorado. Resolution #6: Reduce toxic air pollution in inner city Denver by 75%. Resolution #7: Hold more polluters accountable to clean air. We have a growing membership of people committed to clean air and healthy communities, in Colorado and beyond. We'd love to have you be a part of our efforts to achieve our resolutions in the coming New Year. Together, we can make a huge difference for the health of our families, our children, and our communities. The Boulder Daily Camera today came clean, admitting it was wrong to support CEMEX's efforts to burn tires in its cement kiln near Lyons. The editorial comes as CEMEX was fined $1.5 million for violating limits on dioxin emissions from its smokestack over 100,000 times. While a hefty fine as far as state penalties go, the penalty will have little impact on CEMEX, which in the third quarter of this year made $1.7 billion in profit. The fine amounts to only 0.08% of their third quarter profit, mere pennies to this multinational corporation. This would be like you or I getting a speeding ticket and paying a penny fine. In the case of CEMEX though, not only were they caught speeding, they were driving recklessly, running red lights, running stop signs, failing to yield to pedestrians, and driving at night without headlights. While most of us would get jail time for such a horrendous list of violations, CEMEX got off with a gentle slap on the wrist. Citizens in Lyons have never asked for anything more than accountability to clean air and their health. Kudos to the Daily Camera for coming to its senses and taking a stand in support of their efforts. As a heads up, the compliance order against CEMEX for violating clean air laws and threatening peoples' health is posted at http://ourcleanair.org/uploads/Cemex_COC.pdf. CEMEX, Inc., which owns and operates a cement plant in Lyons, Colorado, just agreed to pay over one million dollars in fines and penalties for violating clean air laws, yet it continues to deny that its cement plant threatens clean air and community health. In a press release from CEMEX, plant manager Steve Goodrich claims that CEMEX has improved operations, improved communications, and improved its outreach with neighbors. Give me a break. CEMEX has consistently violated clean air laws for the last several years, placing its neighbors squarely at risk. Most recently, the cement plant violated limits on dioxin emissions--over 100,000 times. Dioxins are exceptionally toxic compounds; there is no safe level of exposure known. The state of Colorado issued notices of violation to CEMEX in 2005 and 2006 for these and many other violations. Now CEMEX is paying over one million dollars in fines, one of the largest ever paid by a polluter in Colorado. And CEMEX has the audacity to claim it has made improvements? The settlement between the state of Colorado and CEMEX may resolve the most recent violations, but it doesn't do anything to help mend the immense rift the company has created between itself and the local community. Today's settlement seems a clear admission that the company has illegally polluted the air we breathe, placing families and children at risk. A million dollars doesn't even begin to fix the problems CEMEX has caused. In fact, a million dollars is pennies to CEMEX. According to the company's latest reports, it expects to make $4.3 billion in revenue just for the fourth quarter of 2006. A million dollar fine is only 0.02% of one quarter's revenue. At this rate, CEMEX is practically being paid to violate clean air laws. CEMEX, Inc. may feel that polluting our air and forking over pennies is an improvement. For those living under the plume of CEMEX's stack, this seems to be another slap in the face. CEMEX's smokestack at its Lyons cement plant releases mercury, dioxins, and other harmful pollutants. The silver lining in all this is that citizens are not going to rest on this settlement. CEMEX will be held accountable. And while the most recent settlement doesn't get us to where we need to be, it gets us a little closer. Now it's time to pick up the momentum. Well, Rocky Mountain Clean Air Action has been forced to take a much-needed break in the face of Denver's massive blizzard. 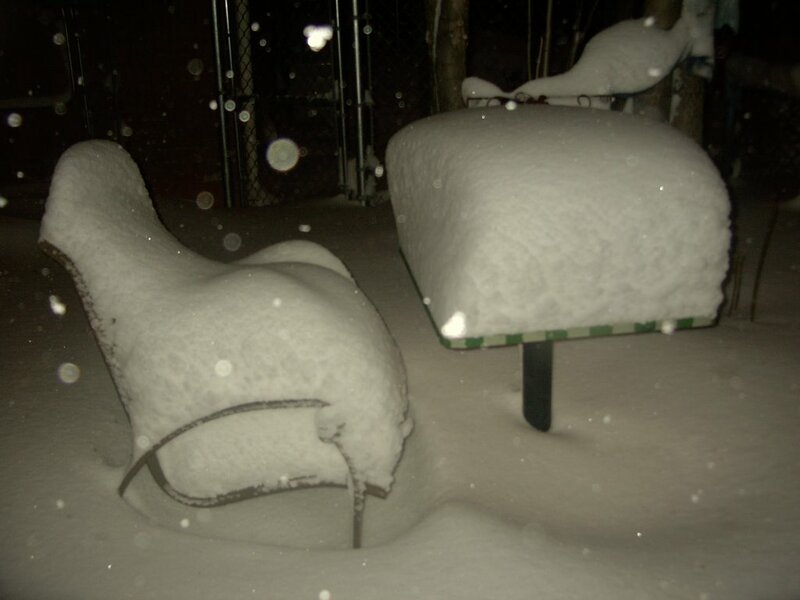 Outside, it looks like there's over two feet of snow and inside there's plenty of coffee. The city's at a standstill as everyone is pretty much snowed in. We hope you're taking some much-needed time off as well. It's been a busy year for all of us, and it looks like we're going to have an equally busy, yet very exciting, year ahead. But before moving forward, let's all take a break, spend time with family, build snowmen with our children, watch movies, and do everything except work. In that spirit, Rocky Mountain Clean Air Action would like to wish its members, supporters, friends, family, and even foes the warmest of holiday greetings! Take care, be safe, and be happy! The Colorado Air Quality Control Commission voted Sunday to adopt new regulations to reduce air pollution from oil and gas developments across Colorado, even in the Denver metro area. For the first time ever, booming oil and gas developments across Colorado will be required to better protect community health from its harmful air pollution. Yet while the new rules are a great step in the right direction, the Air Quality Control Commission rejected pleas from local governments and numerous citizens to strengthen the proposed rule. Rather than require increased reductions in emissions of toxic smog forming pollution from condensate tanks that emit 11 tons/year of pollution or more, the Commission voted to move forward with the original proposal, which called for reductions from tanks that emit 20 tons/year or more. The result: the oil and gas industry will be allowed to foul Colorado's air and threaten people's health. But the Commission's new proposal did not come without its strings. As part of adopting a weaker rule, the Commission also required the Colorado Air Pollution Control Division to provide annual reports on the effects of oil and gas development on air quality and human health, and the progress made toward monitoring these effects. Hopefully, these reports will provide support for further ratcheting down on air pollution from oil and gas development and for better protecting peoples' health. While air pollution reductions did not go far enough, one thing's for certain: the oil and gas industry can and will be held accountable to protecting community health. The latest rule is a great step forward towards holding industry accountable, but more must be done. With the citizens of Colorado showing that they are willing to speak out convincingly for clean air and accountability, rest assured, more pollution reductions will follow. Clean air defines Colorado. Communities throughout the state will not stand to allow oil and gas development to jeopardize this. Mercury emissions from coal burning power plants in Colorado are two to three times higher than reported in the past, according to the utilities themselves. 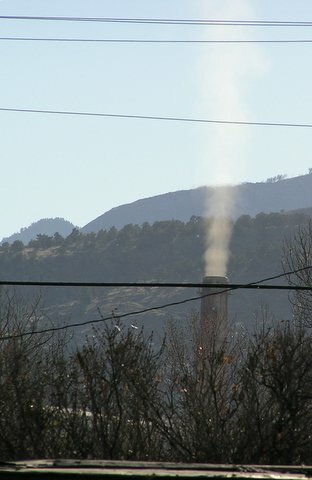 That's right, according to Xcel Energy, Tri-State Generation, Platte River Power Authority, and other utilities in Colorado, their smokestacks have been spewing out more mercury in Colorado than anyone ever thought. 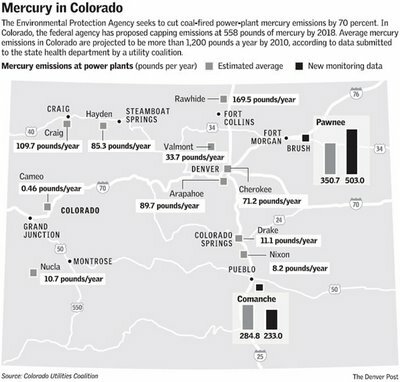 While this raises serious questions over whether Colorado utilities have been lying about their past mercury emissions, most importantly it draws a stark and disturbing picture of the state of our environment. Mercury of course is an incredibly potent neurotoxin that threatens developing fetuses and children more than anyone else. Perfectly healthy mothers can give birth to disabled children due to mercury exposure. If mercury emissions are two to three times higher, that means the risk of mercury poisoning is higher than we ever thought. And while Colorado communities are clearly at greater risk, communities downwind of Colorado also stand to bear the brunt of increased mercury poisoning risk. Utility companies in Colorado are arguing that since their mercury emissions are higher than thought, they should be allowed to release more mercury. Can you believe this? Anybody else would say that since mercury emissions are higher, there should be higher reductions. 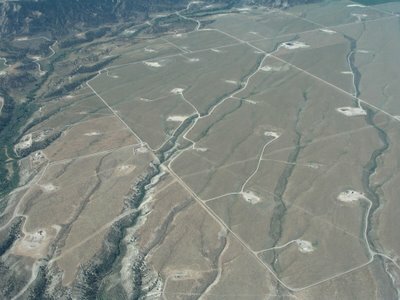 Is it really possible that Colorado utilities are arguing that they should be allowed to poison our environment and children more than ever? While shocking, this appears to be the case. Unchecked smog pollution from rampant oil and gas development threatens Western Colorado communities, prompting community groups to ask the state of Colorado of install air monitors and make industry pay for them. Denver: Smog levels exceeded health standards 66 times last summer, the result of booming oil and gas development in the Wattenberg gas field north of Denver. Southwestern Wyoming: Smog levels exceeded federal health standards in the Jonah gas field in 2005 and 2006 as a result of massive gas development. Northwestern New Mexico: Smog levels in the coalbed methane fields of the San Juan Basin have nearly violated federal health standards. Western Colorado is also experiencing rising air pollution in the face of booming oil and gas development, and, most likely, unhealthy levels of smog. Unfortunately, a lack of air monitors prevents a definitive answer and definitive protection. Studies of air quality in Grand Junction have also found levels of volatile organic compounds similar to those found in Denver. Volatile organic compounds react with sunlight to form smog, raising concerns that Grand Junction may also be experiencing unhealthy smog pollution. In addition to rising oil and gas development in Mesa County, increased traffic and industrial development contribute to air pollution. No smog monitors exist in Grand Junction. The groups are also asking the state to require oil and gas companies that violate clean air laws to pay for smog monitoring. Several companies, including EnCana and Williams, have come under enforcement action by the Air Pollution Control Division on numerous occasions for clean air violations in western Colorado. Just this year, the state has taken enforcement action against EnCana at least three times. Oil and gas companies in western Colorado have paid hundreds of thousands of dollars in fines over the years, money that could be directed toward better monitoring. Oil and gas wells dot the landscape in Garfield County. The request comes as the Colorado Air Quality Control Commission is considering adopting rules that would reduce emissions of smog forming pollution from oil and gas developments in western Colorado. The Commission is set to adopt rules at a hearing on December 17th in Denver. Citizens are worried that without adequate monitoring, there may be no way to measure the success of the rules. Iowa Senator Charles Grassley, a Republican, is seeking to attach a rider to an agriculture spending bill that would allow the agriculture industry to cause as much particulate pollution as it wants, regardless of the impacts to human health. Senator Grassley's proposal would be laughable if it wasn't so scary. The ag industry and its puppet Senator Grassley argue that particulate pollution from agriculture, essentially dust kicked up by farming equipment, fallow fields, and poor land management, doesn't threaten human health. On the other hand, these same people agree that particulate pollution in urban areas does threaten human health. We gasp to read of Senator Grassley's claim that protecting people from particulate pollution in rural communities is, "bad precedent." The only bad precedent here is that his proposed rider threatens human health, especially that of our children. Particulates can kill, whether they're kicked up by farms or spewed by smokestacks. Senator Grassley, who claims to represent the needs of Iowa citizens, should carefully rethink his position on air pollution. Citizens in western Colorado are fast becoming casualties of the latest oil and gas boom. A recent Associated Press article calls vivid attention to the health effects oil and gas development is posing to local communities. The bottomline: people are dying, and not just from air pollution, from water pollution and hazardous wastes. The oil and gas industry is not only messy, it is virtually unregulated. Special exemptions have been carved out in federal laws that allow the oil and gas industry to avoid reporting the toxic chemicals it uses, to avoid having to reduce toxic air pollutants, and to avoid protecting peoples' drinking water. 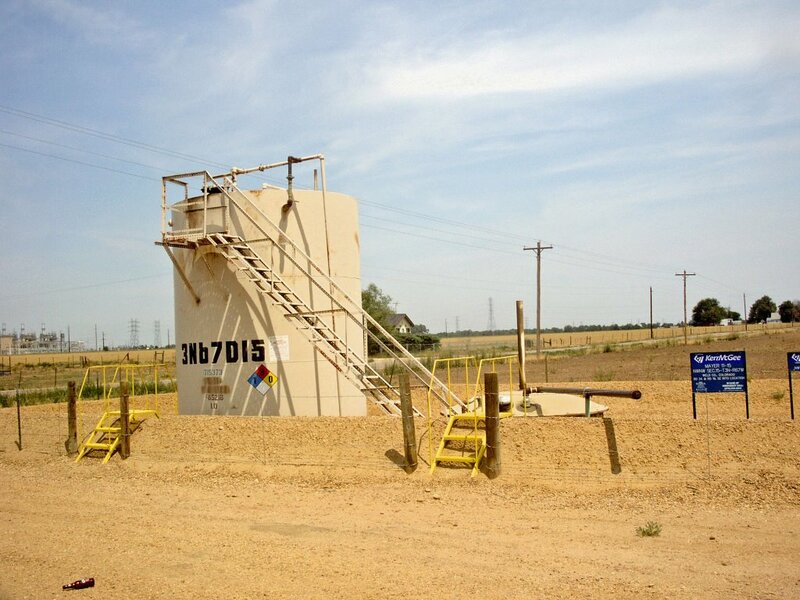 On top of that, the oil and gas industry can drill wells and produce on peoples' property without permission. The industry seems to feel that it can do whatever it wants to whoever it wants, regardless of the consequences. Unfortunately, the law seems to give them the backing to do so. It's no wonder the oil and gas industry is such a killer. But that's changing. Stronger rules to limit air pollution from oil and gas developments are being mulled by the Colorado Air Quality Control Commission. The rules would reduce emissions of volatile organic compounds, including toxic emissions of benzene, toluene, and xylenes. While the rules certainly do not go far enough to fully protect our communities from harmful air pollution, they are a first step toward accountability. These rules are slated to be adopted at a hearing December 17th. It's infuriating what the oil and gas industry has been allowed to do to the lives of people living next to their developments. Surely though, people are standing up to hold the industry accountable to their health. The clean air rules of today are only the beginning. Your Chance to Voice Support for Clean Air in Your Community! Mercury is a potent neurotoxin. It's especially harmful to developing babies. According to the U.S. Environmental Protection Agency (EPA), mercury can harm a baby's growing brain and nervous system while in the mother's womb. According to EPA toxic release inventory data, or TRI data, cement kilns are a large source of mercury pollution in the Rocky Mountain region. Unfortunately, as Clean Air Watch reports, the cement industry is fighting efforts to clean up mercury pollution from cement kilns. The amount of mercury released by cement plants in the states of Colorado, South Dakota, Utah, and Wyoming is equivalent to the amount in approximately 193,505 household thermometers. The amount of mercury in one household thermometer is enough to contaminate all of the fish in a body of water with a surface area of 15 acres. The amount of mercury released by cement plnats in the Rocky Mountain region is enough to contaminate all the fish in a body of water with a surface area of 2,602,775 acres. Given that only 371 square miles of surface water exists in the state of Colorado, this amount of mercury could contaminate all the fish in Colorado tenfold. The EPA is set to decide whether to clean up mercury from cement plants in the United states. The cement industry, including CEMEX, GCC Dacotah, and Mountain Cement should be taking responsibility for the poisons they release into communities, not fighting clean up efforts. Do these companies feel that our children's health should be sacrificed for their profits? We'll soon find out.